The first week of October is a busy week for the members of the City companies. 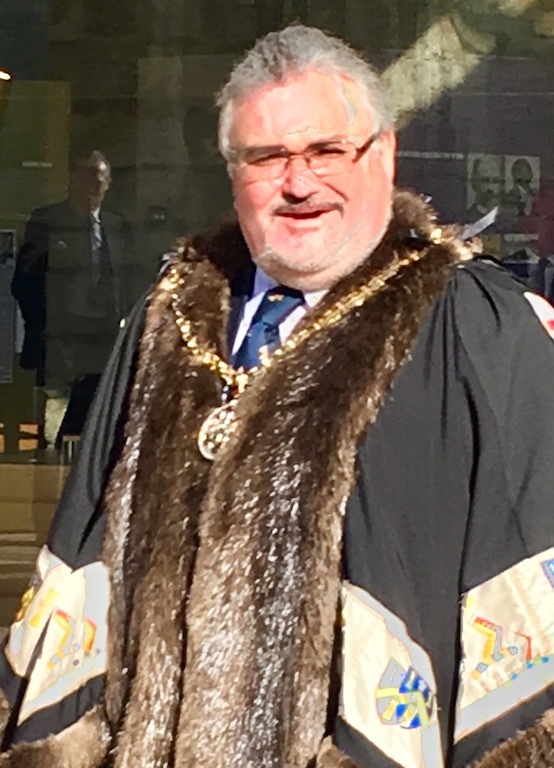 The new Sheriffs (Aldermanic Sheriff Vincent Keaveny and Non-aldermanic Sheriff Liz Green) took office on 28th September and the election of the Lord Mayor took place on 1st October. Many Masters are installed around this time, including the Master of the Worshipful Company of Tylers and Bricklayers. All Liverymen who had been clothed before the previous May are entitled to take part in the Election process for the Lord Mayor which takes place at Guildhall, and the event is called Common Hall. Common Hall follows the same process year in year out, and begins with a procession of Officers of the City and Livery Company Masters (including Master Jeff Fuller - see below) to St Lawrence Jewry for a short church service and thence to the Great Hall. Whilst the Service takes place Liverymen take their place in the Great Hall. This year I sat with Catherine Fuller, Master’s Consort and Framework Knitter and Colin Menzies, Tyler and Bricklayer. The time before processions begin gave us time to chat to fellow Liverymen and marvel at the gothic architecture of the Hall and to spot details of the trials of some famous individuals that had taken place there including Lady Jane Grey, otherwise known as the Nine Day Queen. The livery was invited to vote for two aldermen (who have also served sheriff), from which two the Court of Aldermen would then choose one. The names of each were announced by the Common Serjeant, in the order in which was expected they would go forward. The response to the first name read out was “Aye”, the second name response “Next time” and the third “Later”. The first two names were deemed elected, and the Court of Aldermen then withdrew to choose the first. There were no surprises as Alderman Peter Estlin processed back into the Hall alongside the current Lord Mayor Alderman William Bowman. After speeches by Mayor Elect Alderman Peter Estlin and the two newly retired Sheriffs Common Hall closed and everyone then made a rapid exit from Guildhall to try and catch a few photos of the newly elected Alderman. Tylers and Bricklayers repaired to Stationers’ Hall for a convivial lunch. With an Installation Speech written, this Master Elect had to ensure beds were made, the larder filled and baking and cooking under way ahead of the arrival of four generations of the family joining Malcolm and me for Installation Day. With the family gathered together we headed up to London for this very special day. Whilst the Master Elect joined fellow members of the Court for a brief meeting, our Consort Elect, family and partners of Court Assistants enjoyed coffee before we all departed for St. Margaret Lothbury and the Installation Ceremony and Service. During the Ceremony the Master Elect swears an Oath of allegiance to Her Majesty and to keep the affairs of the Company in good order for the coming year; the outgoing Master is relieved of his cloak and is presented with a Past Master’s Badge, in this case Deputy Master Jeff Fuller received his father’s badge. The new Upper Warden and Renter Wardens receive their badges and gowns of office and then it is the turn of the Mistress to hand over her badge of office to the new Consort. After this short ceremony, the Master and Wardens retire to the Vestry for a few minutes before processing back into the Church for the Installation Service. As Master Elect I was invited to choose the hymns and music for the Service and was delighted to be able to choose my three favourite hymns together with the reading from Paul to the Corinthians on the subject of charity. Reverend Prebendary Jeremy Crossley gave his usual wonderful sermon and Honorary Chaplain John Cook led the prayers. 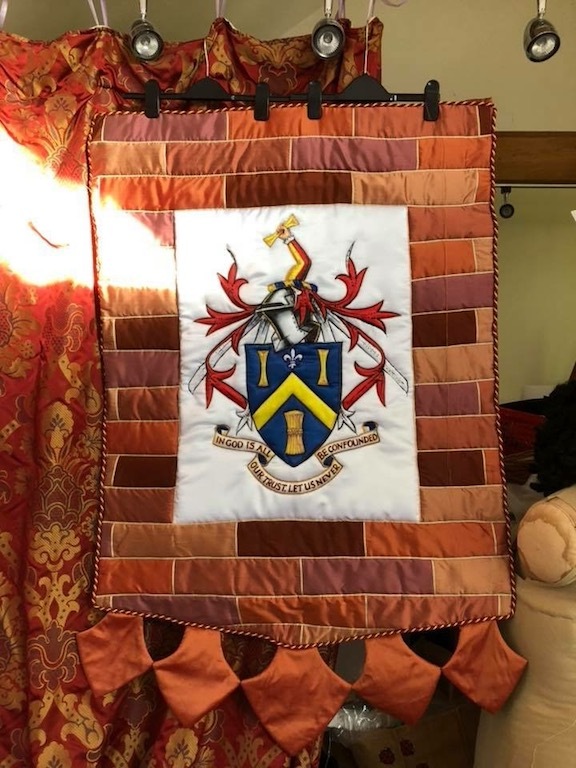 After the Service we processed back to Carpenters’ Hall following the new Company banner made by the very talented Past Mistress Catherine Fuller. A glass of champagne went down very well as the new Master, Consort, Upper Warden Michel Saminaden with his wife Maureen, and Renter Warden Simon Martin greeted all the guests. Our guest of honour for the lunch was Chris Moores, CEO of The Clink Charity, which had been our Charity of the Year, and Master Carpenter Peter Birt QC. There followed a most convivial lunch followed by speeches of welcome to our guests from Alex Maclean Bather, a toast to our guests by Liveryman Diana Malzer, a response by Chris Moores, and then my own as Master. During the speech I was delighted to be able to present Chris Moores with a cheque for £5000 as a result of fundraising during the year. And so begins a new era for the Tylers and Bricklayers with their first lady Master at the helm! August is traditionally a quiet time in the City and the pace has notably slowed and the first two weeks were remarkable for being entirely free of T&B commitments. On the 14th it was back into action for the Craft Committee meeting where we were able to consider the revised criteria for Master Craftsman Bricklayers. The next day saw the Charitable Trust visit to the Fifth Trust at Elham Vineyard in Kent where Maureen Wilson-Wright, the wife of Past Master John Wilson-Wright, is a trustee of some 29 years standing. The work that the Trust undertake is excellent and the rapport between the staff and students was something to behold. We also enjoyed a wonderful lunch prepared by the students. After the visit we enjoyed a tour of Simpsons’ vineyard at nearby Barham where we tasted their Roman Road Chardonnay. Hard to believe it wasn’t top draw Chablis and it is good news that Simpsons are going to be producing wine for the Fifth Trust with the grapes form the Elham Vineyard. Simpsons is unique in having a helter skelter within the winery and Past Master Ian Mitchell-Grimshaw was delighted to take a test drive! The following day I had a most productive and informative meeting at Hadlow College in relation to education and training and was delighted to see that the college has just re-written all its apprenticeship courses to align more closely with the requirements of local employers – no wonder that their training to work ratio is amongst the highest in the country. Hadlow are keen to develop links with the City Livery Companies and it is hoped that there may be opportunities to realise this in the coming year. The 28th saw the Mistress and I on parade at the ACF Cadet Open Day at Folkestone Barracks. The enthusiasm of the cadets was impressive and when one hears so much bad press about today’s youth it is hugely reassuring to meet such capable, confident and considerate youngsters and to see a multicultural range of cadets working with each other and forming friendships which social and religious divides might otherwise preclude. Perhaps if more youngsters joined the cadet forces or undertook other regulated community based activities many of the problems of crime, violence, education and training facing our young might be overcome or at worst alleviated. I should also highlight the excellent work of the Adult Volunteers who often give up their own holiday entitlement to attend the two week Summer Camps and the field trips at other times of the year. It is hard to believe that September will be my last full month as Master but it looks likely to be a busy one. June began with a Garden Party at Buckingham Palace hosted for the first time by HRH Prince Charles. Despite a forecast for rain the weather was superb and the setting and event more than matched it. Sipping tea on the steps of the Palace standing next to the Prime Minister was a little surreal to say the least. The most interesting part of the day was meeting people from a wide range of backgrounds, many with incredible stories to tell. The whole event ran extremely smoothly and was a great experience. The Mistresses’ visit to the V & A followed the next day and the Father of the Company and myself joined the Ladies for lunch at the Alderman’s Dining Room in Guildhall. Mark Groves provided us with splendid fare and the event proved most enjoyable and convivial. On Friday 8th the Mistress and I embarked on the Livery’s Ironbridge weekend travelling via Bristol to attend Liveryman Eric Maxwell’s funeral. It was a poignant occasion as Eric and I joined the Tykers and Bricklayers on the same day. Despite only having been at Ironbridge for the Craft Visit in May, we only visited two sites we had viewed in May. One of these was the Jackfield Tile Museum and it was very pleasing to receive much positive comment about our involvement with the museum and Craven Dunnill had also put various T&B plaques and awards on show. Of the 110 City Livery Companies some 93 Masters were present together with the Lord Mayor and the Sheriffs who arrived on Saturday after Trooping the Colour, and whose consorts returned to London on Sunday morning for the march to celebrate the centenary of female suffrage. The pace of our visit was only marginally slower as we took in 5 museums, two dinners and a lunch in the space of 36 hours. After that it was off to Newcastle to collect Jack before heading back to Southwold on Monday. The following week centred around the Court Meeting and Masters’ and Clerks’ Luncheon at which we were honoured by the presence of Sheriff Neil Retcliffe who commented that this was one of his most enjoyable events and that he was impressed with the friendliness of the T&Bs and the quality of the food and wine. Indeed I have received many similar comments from visiting Masters and Clerks so congratulations and thanks to all involved in putting on this event and indeed to all those present for contributing to such a successful event. Next day the Wine Committee met for its annual business meeting although we still enjoyed a most convivial lunch at the Pig and Goose in the Strand where we tasted some interesting new wines several of which have been added to our list. The ensuing days were spent finalising the Master’s visit to Southwold on 20th and 21st June when 36 Liverymen and consorts joined us on the East Coast. The weather was kind and on the first day we enjoyed crazy golf and afternoon tea with a talk by Nick Haward on the challenges of building Southwold Pier. This was followed by a reception and dinner at a local café/restaurant. The next day saw an intrepid 12 take to the sea aboard the Coastal Voyager – a high speed rib. All returned safely and relatively dry despite Past Master Ian Mitchell -Grimshaw taking the helm for part of the tour! There then followed a choice of a Brewery or Distillery tour and tasting at Adnams’ Brewery in the heart of the town with lunch and drinks available at the Master’s Beach Hut. After these rigours the party reconvened at the Electric Picture Palace for a screening of Michael Palin’s East of Ipswich. The Picture Palace is an authentic replica of a 1920s cinema including a Wurlitzer Organ rising from below the stage! That evening the party met at the Crown for an excellent dinner with a wine tasting before all departed for home on Friday save for the Charity Trustees who held their annual meeting. All seemed to have enjoyed the visit and many in the Town commented on how much they enjoyed meeting the T&Bs. After a weekend of some recovery (Satruday marked the start of the Southwold Arts Festival) it was back to civic duties with Common Hall on Monday 25th June. This was another sweltering day and certainly not ideal for being robed for three hours! The election of the Sheriffs was contested by three non-Aldermanic candidates and I was delighted that Alderman Vincent Keaveney was elected as Aldermanic Sheriff and the Honourable Liz Green as non-Aldermanic Sheriff for the coming year. Liz was supported by a large number of Tylers and Bricklayers and polled twice as many votes as her nearest challenger. Afterwards we celebrated with lunch at Insurers’ Hall where the assembled Company largely comprised T&Bs and Framework Knitters the latter being Liz’s (and the Mistresses’) Company. A month of unbroken sunshine and virtually unbroken events – fortunately July and August look a little quieter although just as warm! June ended with a surprise invitation from Kent County Cricket Club to their Committee’s box at Lords for the One Day Cup Final. Sadly the result did not go Kent’s way but it was a most enjoyable day and nice to see several people that we’ve encountered at various Royal Engineers’ events at Chatham over the year. The warm weather of June turned decidedly hot for July as we officially entered a heatwave and thus the Architect’s Dinner in the non-air conditioned Skinner’s Hall was the first event at which gentlemen were encouraged to remove their jackets. However the top table declined to do so and we emerged somewhat bedraggled after another evening of excellent fare. The next day the Craft Trust met followed by the Private View of the Company’s Exhibition at Guildhall Library and an excellent reception in the Guildhall Club Room. As ever Mark Groves did us proud and it was lovely to see Penny Brooks and indeed John’s newly married son Tom at this well attended event. Sincere thanks are again due to all those who have helped in creating this superb Exhibition and particularly Liveryman and Silver Steward David Allen, Past Master Roger Westbrook and all the staff at the Guildhall Library and the Metropolitan Archive. Those who have not yet visited should ensure that they do so before the Exhibition closes at the end of August. The ensuing weekend saw us at the Kent Show which was yet another scorching day and a fascinating event which I hadn’t attended for some thirty years or so. It has come a long way in that time and was a most professional event. At the President’s Luncheon we were treated to Kentish wines. The sparkling was not a surprise but the excellent white and red were – roll on our visit to the Elam Vineyard next month! Fortunately the Committee had decided to import a number of screens and all were able to watch England’s quarter final victory over Sweden in the World Cup. Sadly the 12th saw us in Southwold for a celebration of Jennifer Fuller’s life. As many of you will know Jenny had been ill for some years and the courage and good humour with which she faced her illness was an example to us all. On the sixteenth Catherine and I were back at Mansion House but bizarrely not for dinner but for fish and chips and Karaoke. The Mistress led the Consorts in a rendition of Abba’s Super Trooper and the Sheriffs – wigs, boots and all - gave a convincing Mamma Mia but nothing could match the Lord Mayor and Lady Mayoress’ interpretation of You’re the one that I want from Grease performed via a Skype call as the Lord Mayor was in South Korea! Back to reality and several candidate interviews and meetings regarding a new Education and Training forum headed by the Worshipful Company of Builders Merchants before Charter Day which this year was fittingly held at Queen Elizabeth’s Hunting Lodge in Epping Forest. Having both grown up in the forest Catherine and I felt there was little we didn’t know but how wrong we were. Our two excellent guides gave us detailed, fascinating and informative tours of both the Lodge and the nearby forest following which we enjoyed an excellent buffet lunch. Many thanks are due to the Mistress for organising the day so brilliantly and to all at the Lodge for their hospitality. Incredibly April 5th marked the start of the second half of my year as Master – tempus indeed fugit! After the Easter break my first event was the Lord Mayor’s Big Curry Lunch at the Guildhall and it was great to see a large number of our Liverymen supporting this excellent event which for the first time benefitted all three services and not just ABF The Soldier’s Charity. In all the event raised an impressive £190,000 and if you have not yet sampled the delight of garam massala in the Great Hall I strongly encourage you to attend next year’s event scheduled for 4th April 2019. The Curry Lunch was followed by the Installation Dinner for the Framework Knitters at Goldsmith’s Hall where unusually I was a guest of the Mistress who is a Framework Knitter. A range of Company administration and meetings followed but the month’s highlight was my visit to Brompton Barracks for the Royal Engineer’s Cadet Open Day at which bricklaying was one of the task stations for the first time. The cadets enjoyed a variety of tasks including arranging tractor wheels with heavy plant, a waterborne initiative test and operating bomb disposal robots although despite these delights many identified bricklaying as their favourite activity of the day – another pointer to the need to expose school students to crafts at an early age! The Easter break made April a relatively quiet month but in May the Livery world springs back into life with a vengeance. 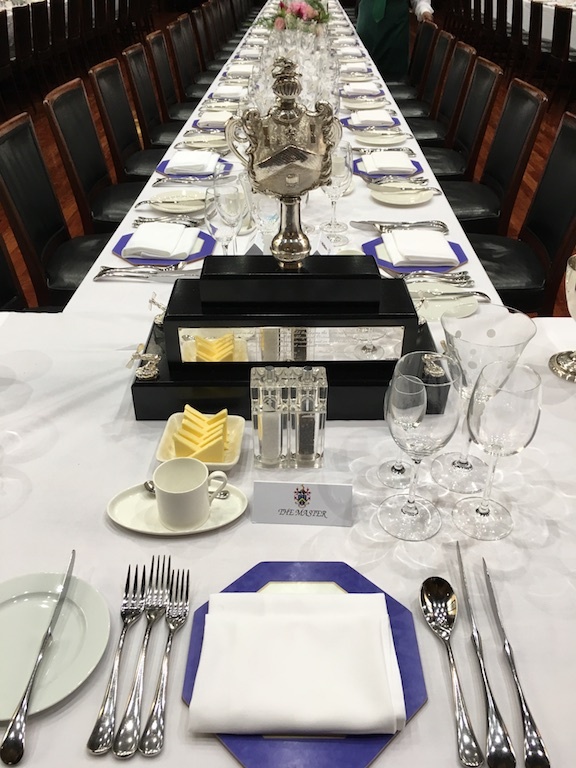 Lunch with HM Judges and Sheriff Neil Redcliffe at the Old Bailey on the 8th heralded a run of six events in three days including the principal event of the Company year, our Annual Guest’s Dinner at Merchant Taylors’ Hall. I hope all who attended enjoyed the evening as much as Catherine and I did. The food, wine and principal speaker HH William Kennedy were all excellent and it is testament to our history and longevity that we dined in the same room in which our Liveryman Ben Jonson had designed and produced a Royal Pageant and Masque for King James I some 411 years before. Particular thanks must go to our Learned Clerk who as ever oversaw a superb and slick event notwithstanding a number of unusual requirements such as the Master and Mistress’s gifts and the viewing and procession of our magnificent new table centrepiece. This is a truly fitting piece with which to commemorate the 450th Anniversary of the grant of our Royal Charter by Queen Elizabeth I in 1568 and I extend my thanks to the Upper Warden, Past Master Roger Westbrook and Silver Steward and Liveryman David Allen for all their hard work in the commissioning and delivery of the centrepiece. We approached the Annual Guest’s Dinner with some trepidation as our room manager for the night confessed to having worked for the Learned Clerk when at the Dorchester - fortunately John had treated him kindly and trained him well as he presided over a near faultless service. The week ended with the NFRC Awards and it was a great pleasure to see Master Craftsman Andy Rowlands receive the Heritage Roof of the Year Award – congratulations (again!) Andy. The following week was no less hectic with the wonderful Sons and Friends of the Clergy service at St Paul’s Cathedral. The next day some 20 of us embarked on the Craft Committee visit to Ironbridge. This was a most excellent trip, and thanks are due to Liveryman David Williams for organising such an informative and entertaining programme and for securing excellent accommodation and catering. It was a particular pleasure to visit the Tile Museum and Craven Dunnill at Jackfield where we also participated in a tile designing and decorating competition. The tiles have been independently judged by Craven Dunnill and the results and photographs will appear in the Upper Wardens’ Newsletter. From Ironbridge the Mistress and I attended the TTA Awards and Gala Dinner at Solihull which was an excellent but late, night to close another busy week. After a few days at home there then followed 7 appointments in 3 days the highlights of which were another trip to Brompton barracks for a Reception and the Sounding The Retreat by the Band of the Ghurkas on 23rd May as well as the launch of the Exhibition of the Company’s History and Treasures at the Guildhall Library on the 24th May. We were honoured by the presence of the Lord Mayor who officially opened the Exhibition and who was still eulogising about this at Christ’s Hospital Speech Day on the 26th May. This was another excellent event in the impressive surroundings of the school and hopefully we will be able to announce our second presentee later this year to follow in the footsteps of Onyinye Udokporo. The students’ march past and salute to the Lord Mayor and the School Band were most impressive and were almost but not quite, up to the standard of the Ghurkas - I have to say that as they have Kukris and the students, to the best of my knowledge, don’t! June highlights to look forward to include HM Garden Party at Buckingham Palace, the Mistress’s Ladies event at the V&A, the Livery weekend at Ironbridge, the Annual Masters and Clerks Luncheon at Armourers and Braziers Hall and the Master’s visit to Southwold. Another busy month in prospect!